A proverb says: "olive is tasty and has a sweet aftertaste"; but, there is a kind of red bacca fruit as big as a peanut is more miraculous than olive. So long as you have one, no matter what sour things you eat, you would feel sweet; besides, this aftertaste effect could last as long as more than one hour. What is the reason? This miraculous fruit is the miracle fruit that comes from the tropical Africa. It contents a kind of egg white enzyme; though the enzyme could not change the flavor of the food, it could change the taste of human beings. In food industry, people often use miracle fruit as the seasoner. 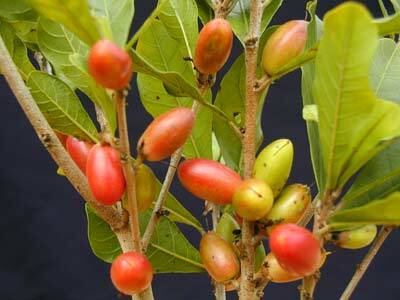 Miracle fruit is a kind of shrub and it has a beautiful shape. China began to transplant it in the 1960s, and it is now planted in many districts as an ornamental plant. It blossoms in September, its flower is white and it fructifies in October; and the fruit becomes ripen in November when it turns red.